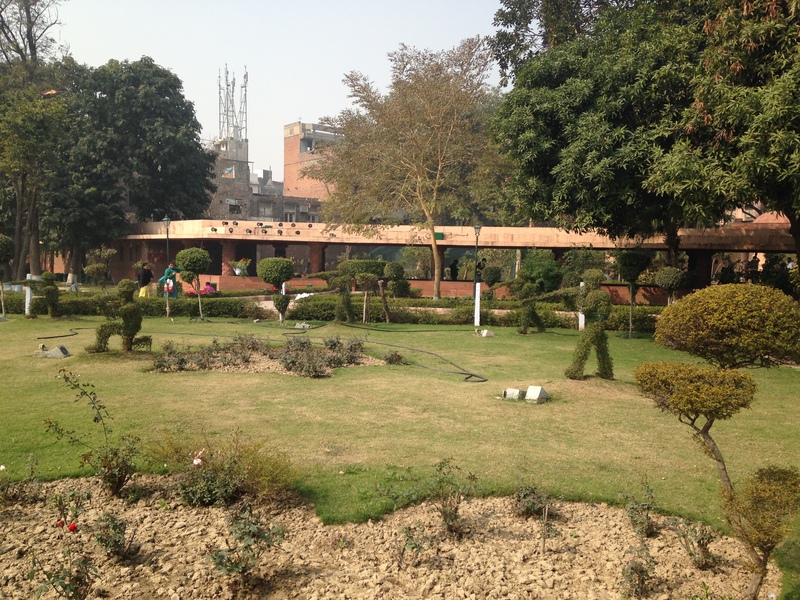 On 11 February this year I travelled with a friend to India. We met our fellow Voyages Jules Verne tourists at Amritsar airport, from where we were ferried to an enchanting hotel for a two night stay. Our first full day in India set very high expectations. As we wove through the streets in three Toyota Landcruisers, my fellow passengers’ eyes were wide in surprise, horror and fear. The lack of any traffic etiquette was alarming; everyone was moving as if oblivious to other vehicles. 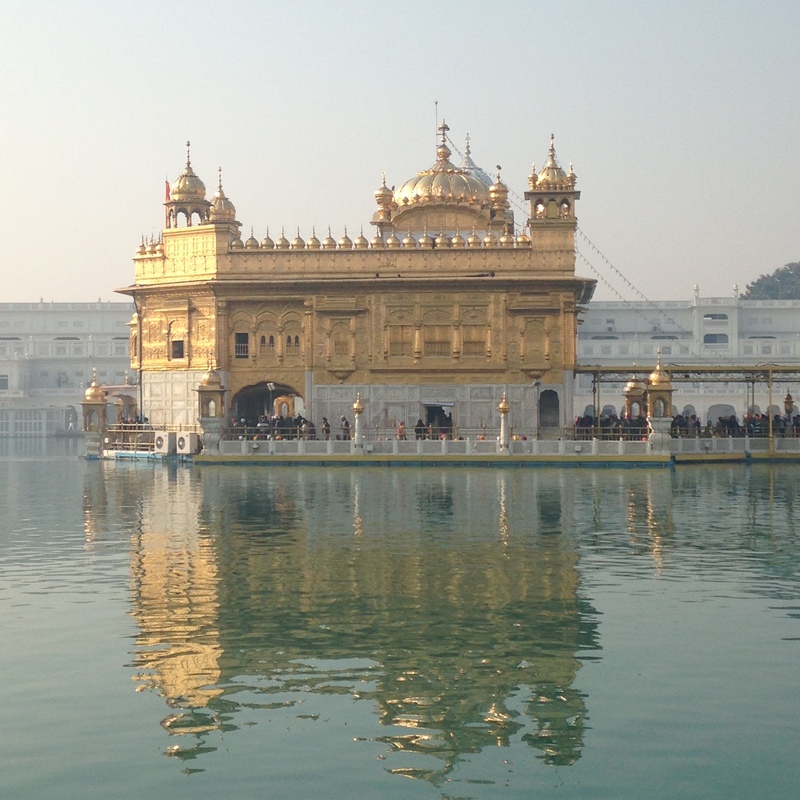 We were a small group of eleven travellers, weary after a 10 hour flight the night before, and we were on our way to visit the Golden Temple of Amritsar. I immersed my bare feet hesitantly into a shallow bath to cleanse them before crossing the temple threshold. We reached out to each other for support and gasped for a second: the stone was slippery and the water very cold, a shock to my system in the 18C heat. In the centre of tranquil Nectar Lake, the temple, reached by a marble causeway of white stone arches, glimmered in the early morning sunlight. Around one hundred kilograms of gold – worth 3,500,000 euro – was reflected in the water below. A half-naked man, his wet dhoti clinging to his lower limbs, was wading, slowly sweeping debris from the water, to keep the nectar pure. We walked to the causeway entrance to take our places in the slow-moving queue of pilgrims. 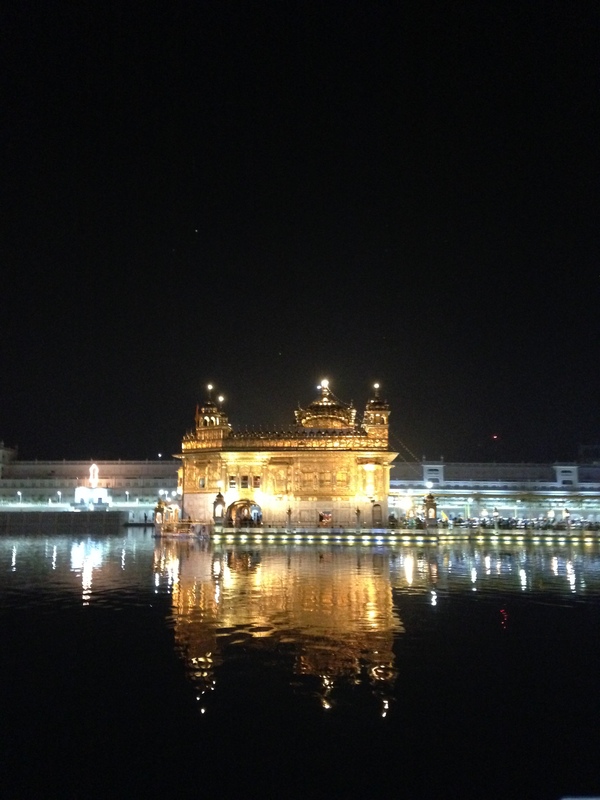 Amritsar is situated at 234 metres, and it was cooler than I had expected; my memories were of a much hotter India. Conversation was hushed; everyone behaved with sensitive respect as we shuffled past holy men seated cross-legged along the route, silently mouthing their prayers, their heads bowed. They come to pay their respects and give a donation to their Holy Book. 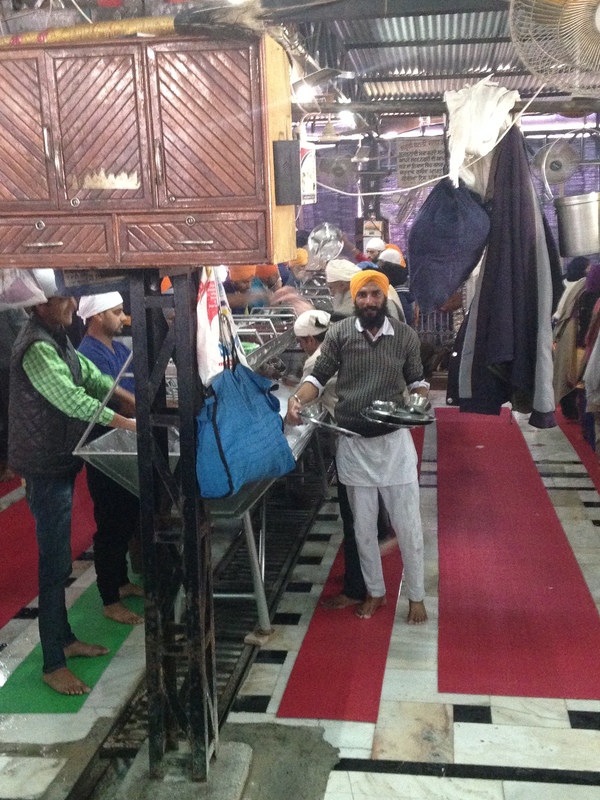 The scene is constantly being televised for Sikh viewers around India. Beneath a jewel-studded canopy, the scriptures are sung to fervent devotees. Musicians and singers join in as lines of Sikhs touch their foreheads to the floor and walls before continuing clockwise towards the exit. We entered the temple. 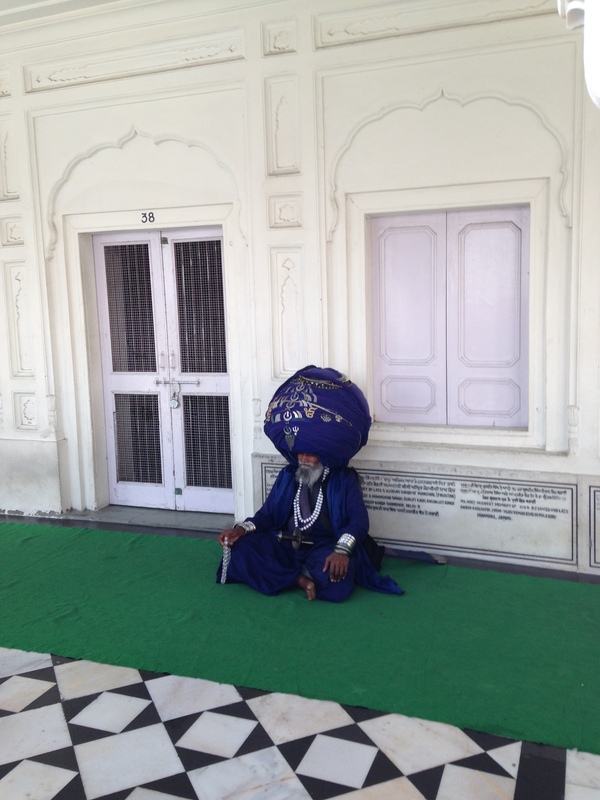 More than a dozen people sqatted around a central low plinth, on which a holy man was seated cross-legged, reading aloud from the huge book, called the Guru Granth Sahib. Part of the religion is to read a passsage from the book daily. Sikhs who are unable to come in person often send a deputy to read on their behalf. 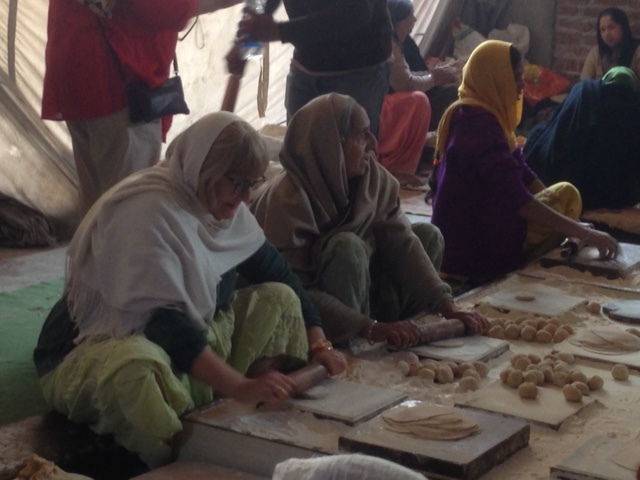 As I watched the scene I felt tremendous inner calm, and could have stayed much longer, but we were due to move on to visit the kitchens, where between 25,000 and 35,000 people come every morning to be served a free meal of chapatis and dal, prepared by volunteers. 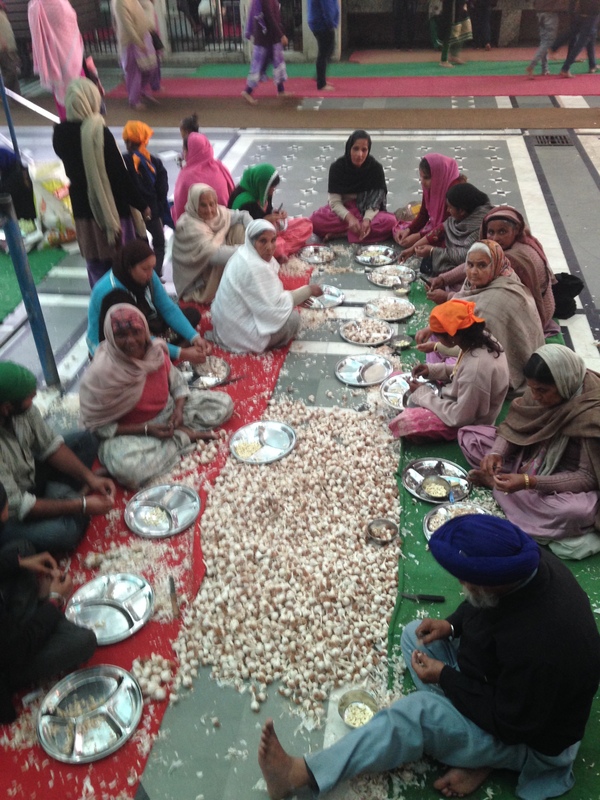 Visitors can assist in preparing and serving the food. 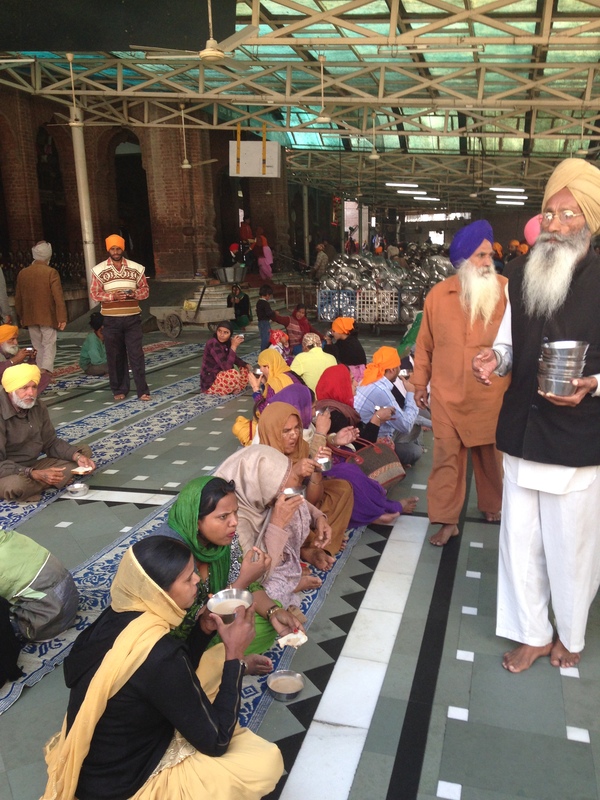 Sikhs believe in the equality of all humans, and there is no hierarchy involved in this; everyone seems to know what to do and when to do it, without being told. 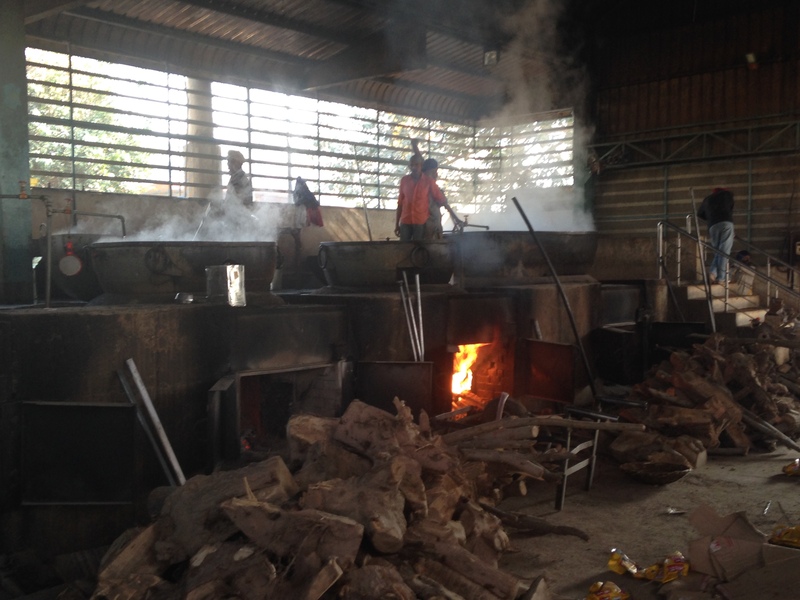 The kitchens are divided into four or five main areas, in which garlic is chopped, chapatis rolled, toasted, and dal is served along from big vats bubbling like cauldrons. One team chops, another mixes dough, another rolls, another cooks, while yet others serve, collect the thali tin trays, wash up and dry, then stack them. The spicy aromas made my mouth water. From the temple we headed for Jallianwalla Massacre park, where in 1919 during a peaceful protest against British oppression the British slaughtered nearly four hundred innocent people without warning. The topiary is a grim reminder of those events, with bushes shaped like rifle bearing soldiers. The very air seemed to smell of sadness mixed with outrage. In the afternoon we drove to the border with Pakistan to witness the changing of the guard. This was an unmissable spectacle. Hundreds of people gather to sing and dance for at least an hour before the ceremony begins. I recognised at least two popular Indian songs, including the very catchy ‘Jai Ho’, from the film ‘Slumdog Millionnaire’. At the ‘moment critique’, platoons of men and women soldiers in dress uniform, complete with towering feather headdresses, goose step at full speed towards the barrier, halt and perform what I can only compare to John Cleese’s ‘Ministry of Silly Walks’, their raised legs vertical, before swirling around and frog-marching back. This goes on for forty minutes while on the Pakistan side only a handful of curious people watch in near silence. After a relaxing massage in our hotel and much needed rest, in the evening we returned to the temple to watch the night ceremony, when the Holy Book is moved on a gold and jewel-studded palanquin from the temple to a sanctum just a few metres away, where it rests for the night. Again, it is volunteers who carry the palanquin, supported by a respectful crowd chanting prayers. The temple is both fascinating and unforgettable.